Having grown up in the West, I’m simply not used to seeing cafe patrons being screamed at and threatened with knives. Still, one of my go-to spots in Yerevan is a casual place where threats of violence are a common occurrence. Despite the drama, it’s still my favorite hang-out in all of Armenia. Every Yerevantsi knows about the famed Vernissage market: an open-air abyss where you can find anything from Soviet-era dental supplies to a full military uniform with all the trimmings. An absolute joy to wander around on the weekend, Vernissage will play host to your most irrational of impulse-buying urges. One friend who was visiting last fall even left the market with a month-old Caucasian Mountain Dog puppy. And he was traveling by motorcycle. But that’s a whole other story. Nestled between Aram and Buzand streets on the eastern edge of Yerevan’s Kentron district, Vernissage takes form in an old park that’s falling apart. Fountains have long run dry, stone walls boast jagged cracks, and the tables that peddlers sell their wears on are rickety and just moments away from tumbling down. Still, Vernissage is home to all types of treasures. My favorite part, though, is always lunch. Because my wife and I originally met through the hospitality exchange site, Couchsurfing.com, we like to host a steady flow of travelers from the site as a way to show appreciation to our digital matchmakers. Plus, we get to show eager travelers our tiny and beautiful land. Vernissage is almost always on the list of places to go when we’re hosting these guests and eventually, after much bargain hunting, we’ll all get hungry and be in desperate need of lunch. Enter the Vernissage canteen. Just north of the artwork area of the market, a few steps away from the animal section, and surrounded by the “Miscellaneous Industrial Crap” department, sits a dark and dingy looking cafe. The drab paintwork is slowly peeling from the walls, the room is dimly lit, and the tables are always piled high with the previous patron’s plates. But, by god, it’s wonderful. An old Armenian lady, whose name I’ve never learned, runs the place matriarch-style and the food never fails to amaze me. 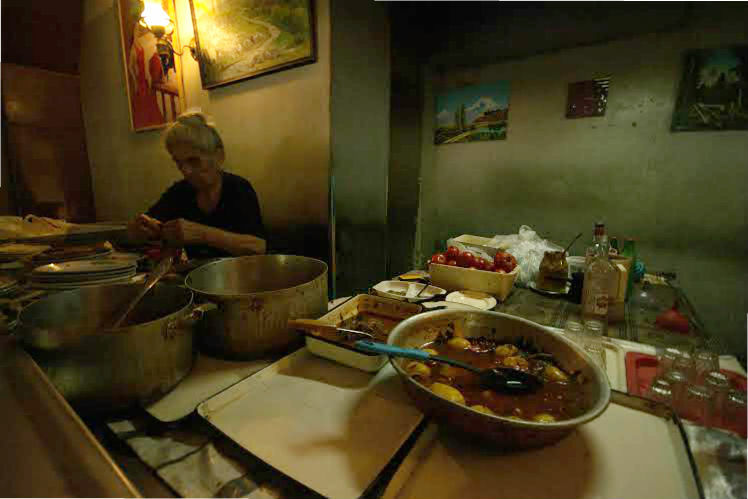 Surrounded by the peeling paint and midday shots of vodka, Mama Vernissage, as we have come to call her, cooks the most delicious of feasts in Yerevan. Everything from leg of lamb, grilled eggplants and tomatoes, fried vegetable patties, mixed stews, rice dishes, omelettes, and soups are lovingly crafted in the aged kitchen. Together, with homemade Armenian cheese, freshly baked bread, and Mama Vernissage’s own home-brewed wine, the place is just the spot when you’re in need of a serious food fest. And the best part: a meal of truly epic proportions will cost you about 1,000 dram a piece. That’s two bucks. You can’t even get a slice of pizza in Vancouver for that amount! Mama Vernissage is a jovial lady. As regular customers there, she always greets us with a wide smile and, on a Sunday, asks why we didn’t make it there for lunch on Saturday. All the while, she’s wielding her trusty blade. The same knife used for expertly stripping eggplant skin, chopping tomatoes, and cutting slices of bread is also used to tame unruly customers. You see, despite her good-humored spirit, Mama Vernissage is not a lady you want to mess with. On more than one occasion, while I’ve been in the middle of placing another slice of cheese onto a hunk of already tomato-soaked bread, I’ll hear some incomprehensible profanities being screamed from the other end of the canteen. Most of the time, Mama Vernissage is taking aim at the table of drunken men being too unruly. Usually in their 60s, these men will be taking a break from selling their goods and come into the small watering hole for a drink. A bottle of vodka or two later and the rowdiness sets in. From somewhere, an accordion will be produced and a drunken sing-along will commence. Eventually, our favorite matriarch will not tolerate the din any longer and she’ll scream at the men, wildly gesticulating her arms in the air – one of which is still clutching her trusty blade – until the disturbance ceases. This is a typical day at the Vernissage canteen. Sometimes, my wife and I will eat there just the two of us; other times, we’ll bring in a big group of friends and the food and wine will be in constant rotation. Either way, we’re always stuffed and we’re always happy. Just a piece of advice if you ever visit the charming place: limit your liquor and don’t tempt Mama Vernissage. She’s not afraid to bust out her knife. Brilliantly written Ben. I found myself chuckling while reading and felt like I was walking through Vernissage. Cheers.